With all the focus on Hillary Clinton's confirmation hearing Tuesday, we've sort of been neglecting the hearings of the other women of the Obama Administration, which have been going equally swimmingly. 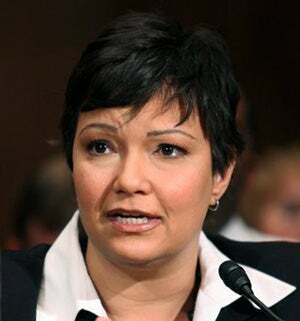 Lisa Jackson, Barack Obama's EPA nominee, faced down tough questions from Republicans who are really keen not to see anyone actually regulate at the EPA and are scared to death that companies might have to stop poisoning our environment in the name of Progress. But Jackson thinks science should trump political ideology — who'da thunk? — and said that environmental negligence weighs on her conscience. And you thought Hillary Clinton's hearings were hot. And if you're not full-up with the womanly awesomeness yet, go check out the New York Times' article about Janet Napolitano in which it's mentioned that she quotes Monty Python, has a photographic memory, laughs at Ed Rendell and plans, basically, to save the world. Oh, and she represented Anita Hill. Come back when you're done swooning, because we're about to get to the bad news portion of the morning. And that bad news is, of course, related exclusively to Obama's dudely nominees who — one by one — are either facing contentious confirmation hearings or delayed confirmation hearings for being, at a minimum, idiots. First up is Eric Holder, whose hearing is today. He get to face questions about the Mark Rich and FALN pardons, his involvement with a long-ago Gore fundraiser at a Buddhist temple (that's one for Napolitano's photographic memory banks, geez) and Rod Blagojevich, so it should be fun. But, hey, at least he's not Alberto Gonzales, right? Right? Are those crickets I hear? Next up on the controversy train is Treasury nominee Tim Geithner, whose new problems stem from having neglected to pay self-employment taxes for four years despite having gotten paid extra by the IMF to offset the additional tax liability. Most everyone thinks that, like Holder, he'll nonetheless be confirmed, mostly because Republicans are unwilling to make a big deal about it because they think he's practically one of them, but his confirmation hearing has been delayed. Finally, the newest nominee to face a delay is Republican Congressman and Transportation Secretary nominee Ray LaHood who, in the wake of the Blago scandal, might face just a touch more scrutiny at his hearing what with all his earmarks that benefited campaign donors. God, when was the last time there was a Republican corruption scandal? Not that any of this is rubbing off on Obama, who is riding high in the polls and facing tremendous pressure to do politically popular things like eliminate torture, use the bail-out money for the housing crisis and adopt an appropriate dog. He's going to face more pressure to stay at the Inaugural Balls for more than 10 minutes. And I could talk about Israel bombing more UN civilian targets in Gaza, but I'm scared that Joe the Motherfucking Plumber might be mean to me. CNN's Rick Sanchez, though, is not and he took him on yesterday in a segment that made my ladybits tingle.